M/M: Talea Amaretto of The Royal Club. V/P : Millennium Mastiff’s Gustav. M/M : True Love Gwyneth v.d. Duncanhof. F/E : C.J.M. Algra v.d. Hoek. V/P : Multi Ch. Barnaby Brullemail. M/M : Seasidemastiff ’s Azores. F/E : Mevr. H. Alberts. E/P : Saenen - Steegmans Cristof & Lieve. Kingston du Domaine de Straz. V/P : Jason du Domaine de Straz. M/M : Icara du Domaine de Straz. F/E : Strazzeri D. & Delterne S.
V/P : Dralions Sherwood Wookee of Kregen. Never Walk Alone Living Xtra Large. V/P : Nl. Ch. Mr. Magnanimous van de Gerelshoeve. M/M : Nl. Int. Veteran Ch. Perra Amiga van den Duncanhof. V/P : Jorden S. from the Burning Mountain. M/M : Vanya v.d. Duncanhof. F/E : v.d. 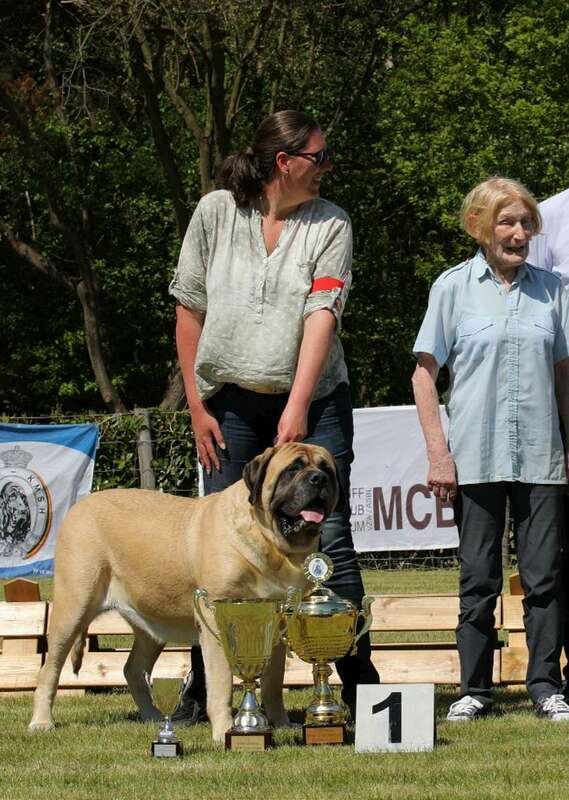 Hillse Mastiff’s. Lola de la Vallée des Mountches. V/P : CH. BE. Flush Funky dit Ficus de Whititera. M/M : Ch. BE. Estrella de L’escane Crabe. Pops of the Mountainous Mastiff’s. M/M : Ollie of the Mountainous Mastiff’s. M/M : Talea Amaretto of the Royal Club. E/P : Isolde Schmidt & Dieter Lessner. Talea Amaretto Of The Royal Club. V/P: Hulk Hogan Of Seven Oaks. E/P: Schmidt Isolde & Lessner Dieter. Ollie of the Mountainous Mastiff’s. V/P: Hulk -Hogan of Seven Oaks. V/P : Arthur of Seven Oaks. M/M : Elsa - Simba v. Trufterhain. E/P : Schmidt Isolde & Lessner Dieter. 1 Octavia of Seven Oaks & Quinn of Seven Oaks. 2 Erebor’s Gucci & Joop van illusion of Grandeur. Mufasa of the Mountainous Mastiff’s. 1 of the Mountainous Mastiff’s. 2 de la Vallée des Mountches.